We're back once again with yet another edition of Digital Digest. This week, we've got a review of Mighty Morphin Power Rangers - Season 3. Let's get going! Three weeks ago, we mentioned that the fifth (and final) season of Hazel would be coming to DVD soon, and now, it appears that Hazel - The Complete Fifth Season has been tentatively confirmed for a January 14 release. The set will complete yet another series on DVD (we're always glad to see that happen! ), and will come at a $34.93 MSRP. TVShowsOnDVD.com came across another very interesting piece of news from Shout! Factory this week, and it isn't a show that we'd normally cover... but it is news for another reason! Apparently, Shout! Factory will be releasing the series NYPD Blue, beginning with NYPD Blue - Season Five. While this doesn't seem that big, it marks a new release of a series that Shout! Factory has never released before from the 20th Century Fox library, and considering that we haven't seen any Fox releases from Shout! Factory in quite some time, this gives us hope that perhaps some other series from the studio are on the way. We'll keep an eye on it! That isn't all of the news from Shout! Factory for this week! Two more releases are in store for January, although these are just season releases of series for which we've already seen the complete series. On January 7, we'll get to see Barney Miller - The Complete Fourth Season. Then, a week later, on January 14, they'll follow up on Dobie Gillis with Dobie Gillis - Season Two. CBS announced this week that they will be expanding their full-episode streaming app to even more users. The iOS app has been available for quite a while now, but now, it is also available for Android and Windows 8. And that isn't all. They'll follow up later this year with a Blackberry app. The app allows fans of CBS series to enjoy full episodes of all entertainment series on the CBS lineup within eight days of their original airing, as well as viewing of episodes of several vintage TV series such as Perry Mason and Star Trek. Tuesday (October 8) is a slow day for releases, but there is one sitcom release of note, as Warner Home Video finally brings fans The Middle - The Complete Third Season. Also, New Video Group gets the entire run of Inspector Gadget in one megaset in Inspector Gadget - Megaset. Back to the Command Center we go! Following its debut in 1993 (hence why the MSRP is $19.93! ), Saban's iconic live-action pop culture series, Power Rangers quickly became the most watched children's television program in North America and Shout! Factory is releasing each season on DVD. We are now into the third season of the original series and we get them all on one set this time! In season three, as the battle rages on, the Power Rangers are forced to go on a quest to seek out the fabled master ninja, Ninjor. Ninjor teaches them the art of Ninja, giving them new powers and abilities, as well as joining the team himself. Assisted by their new Ninjazords, the superheroes are ready to do battle with Lord Zedd and Rita... but the forces of evil are also reinforced as Rita's brother Rito Revolto and her father Master Vile arrive on the Moon! . 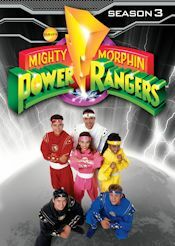 Starring Steve Cardenas as Rocky the Red Ranger, Johnny Yong Bosch as Adam the Black Ranger, Amy Jo Johnson as Kimberly the Pink Ranger, Karan Ashley as Aisha the Yellow Ranger, David Yost as Billy the Blue Ranger and Jason David Frank as Tommy the Green Ranger. Catherine Sutherland replaces Amy Jo Johnson later in the season as Katherine the Pink Ranger. Among the most memorable episodes from the third season include the three-part premiere, "A Friend in Need," where Alpha's birthplanet Edenoi is under attack by a spaceship under command of Count Dregon, thus the Rangers (minus Kimberly who has the flu) teleport to Edenoi to find out what's going on, while Lord Zedd and Rita make a plan to invade planet Earth. In the four-part saga "Ninja Quest," Rito Revolto, the brother of Rita, pays a visit to Lord Zedd and Rita and plants some eggs nearby, after that Rito teleports to the planet Earth and lures the Rangers into a trap, but just when the Rangers think they get to destroy Rito, Rito gets help from four other monsters made by Lord Zedd. In "A Brush with Destiny"," Kimberly has been having nightmares about moving to Paris, while Finster creates a device that lets Rita and Zedd see the dreams of others, including Kimberly's nightmare, as Zedd creates a plan by making Artistmole, the monster in Kimberly's nightmare, real to destroy the Earth as well as the Rangers. In the Christmas episode, "I'm Dreaming of a White Ranger," on Christmas Eve, Zedd and Rita send their troops to the North Pole to capture Santa Claus and his elves, thus preventing Santa from delivering his Christmas presents, while Kimberly misses her parents, who won't be able to go come for Christmas. In the three-part episode "A Different Shade of Pink," Kimberly meets up with Gunther Schmidt, an international gymnast trainer, he offers Kimberly to coach her for the Pan Globals, because of this Kimberly no longer has time to fulfill her duties as a Ranger. The arc ends with Kimberly giving her pink power coin to Katherine. Packaging is a snap case holding the discs inside, similar to the previous releases. The cover art of this season has all of the Power Rangers (Black, Yellow, Red, Pink, Blue and...White) with the Mighty Morphin Power Rangers logo above them. The color scheme is grey/silver for this volume. The back of the case has a synopsis of the show, the set, and technical information. We also have a shot of Lord Zedd & Rita and another one with the rangers as ninjas. Inside the case, there is a disc-by-disc breakdown on the left panel, listing every episode on this set. The background is in dark grey. We just get episode titles, though. The discs don't overlap each other, which is great. We have two plastic holders in the middle. Discs one and two are on the first plastic holder, while discs three and four are on the second one. Artwork on the discs is in that grey/silver color scheme, with the Mighty Morphin Power Rangers logo and whatever disc number it is on the disc. This is all similar to previous releases. The disc-by-disc breakdown is available in the above section in episode runtimes, but basically we have about 8-9 episodes on each disc. This is the first season the season isn't broken up into two volumes! As for the menus, the main menu is very cool and similarly designed to previous sets. We have the addicting theme song playing in the background, and we have the logo then we enter the Command Center! Instead of where we see Zordon, we have clips playing in the background! Very cool! The main menu options are: Play All and Select Episode. No subtitles, but the DVD is closed-captioned. When we select the Select Episode option, we have a cool transition into that submenu with the alarm sound for the command center playing in the background. The episode number and titles are listed inside that option. Pretty easy to navigate and nicely designed, I think. It's basic but cool...and consistent to previous releases. The video quality is decent and on par with the previous season sets. It's not great, but not terrible either. It is certainly better than VHS and any episode you might have recorded originally on Fox Kids or in reruns. I noticed some episodes started with the TVY7 rating...weird, maybe those were recorded from TV? I hope not. The audio quality is also good, that is crisp and clear. No problems here at all once again. The series had to be pretty cheap to produce as it looks very cheap, but hey, everyone loved watching it! There are once again 6 chapter stops for every episode, counting the opening and closing credits stops. All of the multiple part episodes have the "To Be Continued" line at the end of each episode, but once again we don't have any of those "Previously on Power Rangers" recap at the start of the next episode, just like we don't have the "Today on Power Rangers" preview on every other episode. I always liked those, so I'm disappointed. We have zero special features once again. The complete seasons 1-3 release has special features from Time Life. But these individual releases that Shout! released didn't have those. As mentioned before, that complete series has new interviews with the cast, casting director, fans, plus all the direct to video specials that were released. I don't think the original pilot episodes was included, which is a shame. In 1999, Fox Kids aired an original unaired pilot episode hosted by Austin St. John (Jason the Red Ranger) and Walter Emanuel Jones (Zack the Black Ranger). It is on YouTube even, as we mentioned last time. This pilot had a different yellow ranger and some other plot changes. We also had another unaired pilot episode but it has never been seen, so that would have been nice, too. Anyway, nothing on this set at all! That's a wrap for the original series on DVD. The third season was cool but not as good as the first two seasons. It's goodbye to the original series and three quarters into the season we said goodbye to Kimberly. She was my favorite. I highly do recommend any fan of the show to pick-up this set, because the episodes are so good and addictive. It's cheesy fun. If you've never watched it, then please do try it, especially if you watch the new series. Die-hards might want to go for the complete series set. The only thing missing on this set are the previews before each episode, but that's not a big deal. Everything else is pretty well done on this set. My only other gripe again was no bonus features, but that is probably exclusive for the complete series set from Time Life. Anyway, it's Morphin Time with the new Pink ranger..and no need for us to go to the Command Center and buy this DVD because we have a link below for you to order. Hurry before Rita and even brother Rito come get you! Who to Follow: Nelson Franklin (Twitter), "I don't drink enough water"
Claim to Fame: The name may not seem all that familiar, but Nelson Franklin is an up-and-rising comedian who got his start as Nick, the IT guy on The Office. In 2011, he got a starring role of his own in the Fox series Traffic Light, but unfortunately, that didn't work out too well and it was quickly cancelled. Last season, he made appearances on the Fox series New Girl, but now, he is back in a starring role as Adam on the new CBS comedy, The Millers.